This is a class I have wanted to teach for quite some time. Gary LaFontaine was a huge inspiration to me as a tyer and angler. I wanted to share some of his theories and patterns with others who may not be familiar with his work or who wish to re-visit his unique genius. I was introduced to Gary – like many other anglers, I’m sure – by his book Caddisflies. His scholarly treatment of an overlooked segment of fly fishing entomology struck me profoundly. This stuff really made sense, and the flies caught a lot of fish. Shortly thereafter, a friend gave me Gary‘s video “Tying & Fishing the Attractor Flies.” I tied them. I tried them. They worked. Magnificently at times. I was fully on board with his theories at that point. I had the pleasure of speaking with Gary on a number of occasions. He’d freely discuss tying and fishing techniques, materials, new patterns, and on and on as long as any one would listen. His tying demos were especially informative and entertaining. I participated in a fly swap with him where it was a thrill to receive a fly tied by the master himself. It holds a special place of honor in my collection. Signing my Trout Flies: Proven Patterns book with the inscription “For great days on the Calapooya” (my local river), he could not have known how true that statement would be. On second thought, he probably did. Let’s explore some of his theories, tying techniques, and patterns. Gary and his team were the first tyers to go underwater and systematically study trout reaction to flies. Through scuba diving and testing of literally thousands of patterns, Gary brought a scientific testing approach to the development of his flies. Some think he was a rebel because of theories that ran contrary to common opinion, but Gary said he just let the research speak for itself. The trout gave the final verdict. He may not have immediately understood why a particular characteristic was important, but he did not allow his biases to affect the development of the flies. Most things in fly tying have been done before, somewhere by someone. But antron (a tri-lobal carpet fiber developed by DuPont) was invented in the 1970’s, and Gary was certainly the first to see its application for his caddis patterns. Antron became a key component of many of his flies over the years. Dyed antron yarn was used on his Deep Sparkle and Emergent Sparkle Pupa caddis flies and clear antron filaments were added as a topping to the wing on his Diving Caddis pattern, and used to represent the spent wings on his Clear Wing Spinner. Clear packing foam and a special blend of dubbing became innovative elements for a lot of his fly designs. We’ll explore these in more detail later with the tying sequences. Glo-wrap, foam cylinder underbodies, and specially made flex-hooks round out some of the more interesting materials utilized in Gary’s flies. Caddisflies (1981) was a landmark scholarly, scientific treatment of a previously overlooked aquatic food source. It took Gary more than ten years to research and write the book, and it literally expanded the field of aquatic entomology when he was done. He knew from earlier authors and his own underwater observations that the caddis fly carried air bubbles with it upon ascent to hatch and also during its egg-laying activity. The use of combed out antron as a sheath around the body to mimic the air bubble was pretty revolutionary. Tinsel had been commonly used to imitate this “sparkle,” but the antron sheath was superior in imitating this characteristic. Gary’s series of caddis patterns include the following: Free-Living Caddis Larva, Deep Sparkle Pupa, Emergent Sparkle Pupa, Dancing Caddis, and the Diving Caddis. This brings us to the magic of the Diving Caddis. Truly a “go-to” fly for me and many others. Why? It is an excellent crossover pattern that can be fished – stream or lake – throughout the water column. Plastron Respiration: the female takes an air bubble with her when diving underwater during egg-laying activity in order for her to breathe. The Diving Caddis imitates the female egg-laying stage of the caddis fly. The flash of antron allows this fly to be used as an emerger as well, so it is crossover pattern. It could be greased and fished on top, too. I’ve used a bead head version down deep in streams with much success. It is a very good all-around pattern when caddis are about. Gary’s work extends beyond just caddis flies, of course. One of his more interesting mayfly imitations is the Halo Mayfly Emerger. It utilizes clear antron for the tag, clear packing foam for the wing buds (the “halo”), and a spike of orange deer hair. Why orange deer hair? The mayfly pumps fluid into its wings upon breaking from its nymphal shuck in order to extend them. This process creates a distinctive orange tint to the wings. The exaggerated color of the bright orange wing apparently acts as a strong trigger. The Halo Mayfly Emerger has a trailing shuck of marabou fibers, the halo effect of the splitting shuck represented by the clear foam at the sides, and the orange deer hair spike for wings. A very effective imitation. This is a nice pattern for me during BWO hatches on the Metolius. Next up is an all-purpose nymph that employs an important tying technique called “Double Magic.” The Twist Nymph – in different varieties – is a versatile fly that can be tied with or without a metal bead. The Double Magic Technique: wax the thread with a tacky wax, then pat the dubbing to it; create dubbing loop, insert a strand or two of peacock then twist it together. Wrap forward, creating a nice peacock body with fibers of bright antron throughout. These fibers create an aura around the body as they collect air bubbles, which suggests life. No other technique can accomplish this desired result – they suffer from the barber-pole effect of wrapping two materials together. The Double Magic technique originally employed peacock herl, but Gary subsequently used pheasant tail and ostrich herl as variations and, they too, tested very well. For what it’s worth, a small PT Twist Nymph has proven to be an excellent chironomid imitation for me on lakes. This technique can be used on the venerable Prince Nymph to create the Enchanted Prince Nymph. You can apply the technique to other flies like soft hackles and other nymphs as well. There are characteristics that can be exaggerated on an artificial fly. Understanding these triggers are the keys to developing effective patterns that will be seen, moved to, and taken by the fish. Size, form/bulk, color, and shape can be exaggerated so as to make the artificial superior to the natural. Yes, superior. You want something that stands out in the crowd, so to speak. Even when fishing an imitative pattern, if it merely blends into the myriad of naturals, your chances of success are reduced. If, however, you have a strong triggering characteristic incorporated into your fly, your odds are improved. These principles apply to developing attractor flies, as well. In non-feeding situations, attractors come into play, particularly fishing a dry fly. Exaggeration of certain trigger(s) can make for a good attractor. Not only do you want fish to notice your fly, but they must move to it, and then fully commit. That’s what makes the next fly a real wild card on the water. One of Gary’s best attractor flies is the Air Head. Created as a control fly when testing the diffusion of light via the clear foam, it proved to be an effective attractor fly in its own right. It is a very bright fly that definitely pulls fish, but is perhaps sometimes too bright which elicits plenty of last-moment refusals. Under these conditions it is a great fly from which to drop a small nymph. Bring fish over from far and wide, tempt with a little nymph, then hang on. Primarily tied with a bullet/bubble head of clear foam spikes, it is unsinkable. Smaller sizes (#16-20) make great little panfish flies. It has also become an effective imitation of the Little Yellow and Little Olive Stones, so it can serve a dual role in the fly box. 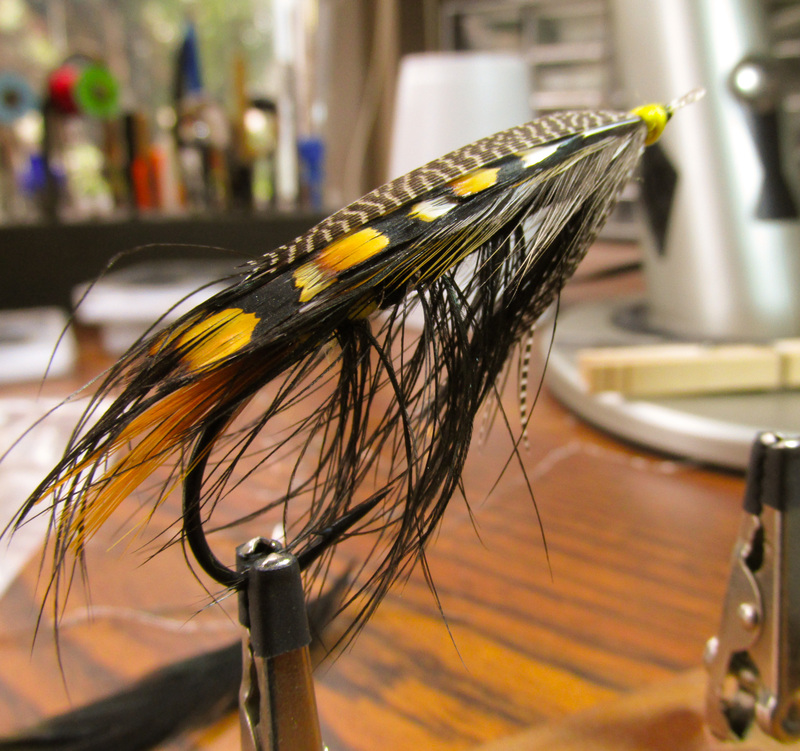 The Double Wing: one of the most effective dry flies I’ve ever used when applying the color theory of attraction. It employs a short yarn tail and a tag of white floss covered with a dyed deer hair rear wing. This shrouds the hot spot of color at the rear of the fly. The body is the predominant color of light and the down wing is white calf tail. Tied much like a Trude, the color schemes and the ‘hot spot’ of color make this a tremendous attractor fly when used under the appropriate light conditions. Tear Drop Nymph: use of Glo-Brite, an attractor nymph? I hope this class will stoke or rekindle your interest in tying and fishing some of Gary LaFontaine’s flies. I have tried to select patterns that demonstrate a material or technique that you can apply to other flies as well, Gary’s or otherwise. If you can tie his most famous fly – the Emergent Sparkle Pupa – then you can tie the complementary Deep Sparkle Pupa. The Halo Mayfly Emerger teaches the principles of tying the Halo Midge Emerger. The Double Magic technique can be applied to many flies as well as the three Twist Nymph variations. With the Twist Nymph series, you can cover a variety of nymphing conditions from stream bottom to surface film. Tying a full color set of Double Wings gives you a proven set of attractor flies that will work under various light conditions. The Diving Caddis is a solid all-around wet fly, and the crazy Air Head is a wild attractor fly that might give you something to turn to when the rest of your flies are lacking. It’s an excellent ‘bob fly’ from which to hang a second fly, too. We’ve just scratched the surface of the LaFontaine legacy today. Trout Flies: Proven Patterns listed 62 patterns, and 20+ were developed by Gary and his team after its publication. I have found that Gary‘s work tends to take away some of the uncertainty of which fly to use in various angling situations. I may choose incorrectly or mis-read the situation, but at least I usually have a reason for fishing the fly I do. And I truly enjoy tying his unique patterns, knowing they will help me cover more situations on the water. May you enjoy tying and fishing the LaFontaine flies. Dennis, Jack. Tying Flies With Jack Dennis and Friends. Snake River Books, 1993. LaFontaine, Gary. Caddisflies. Lyons & Burford, 1981. LaFontaine, Gary. Challenge of the Trout. Mountain Press Publishing Co., 1976. LaFontaine, Gary. The Dry Fly: New Angles. Greycliff Publishing Company, 1990. LaFontaine, Gary. Fly Fishing The Mountain Lakes. Greycliff Publishing Company, 1998. LaFontaine, Gary. Trout Flies: Proven Patterns. Greycliff Publishing Company, 1993.